Beyond the Notes: Music Inspired by Art is a program of original chamber music, and a multimedia guide for web & mobile, illuminating art, music, and the connections between them. Beyond the Notes: Music Inspired by Art uses music as a lens on visual art and a point of entry into explorations of art history. This website / mobile web app features in-depth explorations of six different visual artists through 24 pages, 47 audio clips, 29 images, and 32 videos, which include interviews with senior curators at major museums. Bringing "program notes" into the 21st century, Beyond the Notes delves beneath the surface of works of art with the belief that educational materials can be artistic, just as art can provide powerful opportunities for learning and exploring ideas. By spring 2011, I had composed several works of chamber music inspired by visual artists ranging from Georgia O'Keeffe to Michelangelo. Aside from music for music's sake, I wanted these works to become learning tools: emotionally impactful and transporting points of entry into the intellectual and aesthetic content of visual artworks. Stemming from this goal, Beyond the Notes was conceived as a new model of multimedia companion for art events. I envisioned a freely available, mobile-friendly guide that could be accessed prior to and after performances (and even in the concert hall itself). This would further the audience's learning both by providing art historical context and by using detailed analysis of the music as a tool for close viewing. I built the website / mobile web app utilizing exclusively web-native technologies (HTML5, CSS3, jQuery Mobile) and media embeds (HTML5 audio and JW Player). The 30+ videos on the website feature 100% original footage, music, and voice-over narrations. I used Adobe Premiere for all of my video editing. For the video segments on the works of painter Charles E. Burchfield, I traveled to Buffalo, NY to photograph the suburban area where he lived and painted. I filmed an interview with Nancy Weekly, the world's foremost living Burchfield scholar, at the Burchfield Penney Art Center. I also interviewed New York City-based painter Carol Steen, co-founder of the American Synesthesia Assocation, who spoke to me about synesthesia and how it relates to Burchfield's works. For the section on Hudson River School artist Thomas Cole's cycle of paintings "The Course of Empire," I filmed an interview with Linda S. Ferber, Senior Art Historian at the New-York Historical Society, in New York City. I also traveled to the Hudson River Valley to film an all-important influence on Cole's artistry: the landscape. 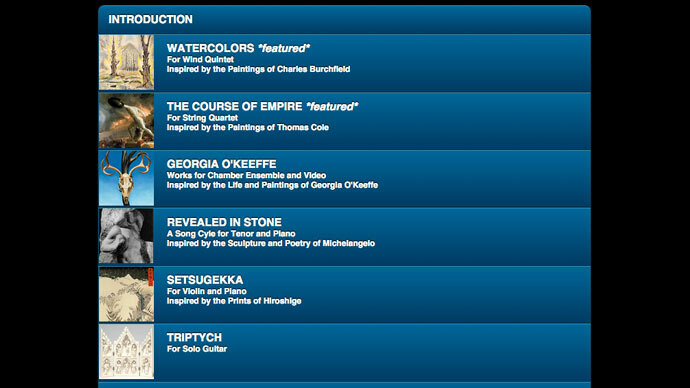 The pilot version of the Beyond the Notes website was created to accompany the summer '11 performance of my string quartet based on paintings by Thomas Cole at the Peabody Essex Museum outside of Boston, in coordination with the opening of a national touring exhibition. This iteration of the project received a positive reception from The Boston Globe. The full website was launched in fall '11 to complement a concert I produced at New England Conservatory in Boston, which featured six different chamber ensembles performing seven pieces of music inspired by art accompanied by video projections of the works. The website explores the connections between the music and the art in detail and, ultimately, may have been most effective as a "stand-alone" resource (to be consumed apart from specific live performances). The video content also continues to enjoy an extended life on YouTube. Production of Beyond the Notes: Music Inspired by Art was supported in part by an Entrepreneurial Grant from New England Conservatory's Entrepreneurial Musicianship Department. 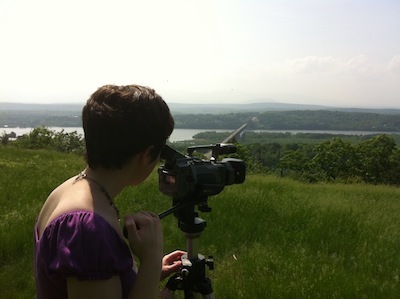 Yours truly filming in the Hudson River Valley, 2011. 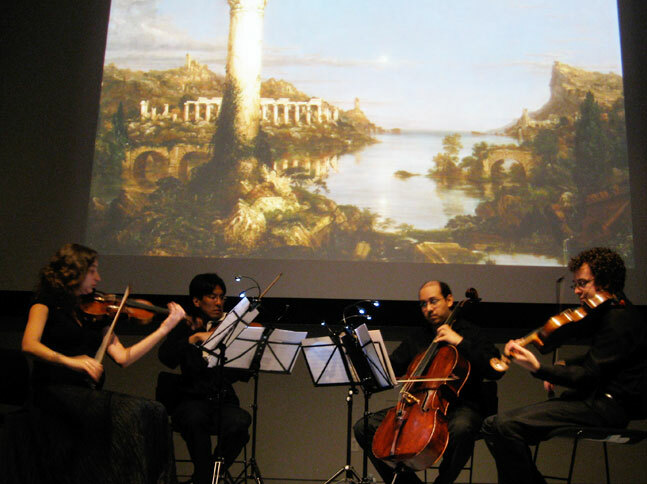 String quartet performing "The Course of Empire" with video projection at the Peabody Essex Museum in Salem, MA, 2011.